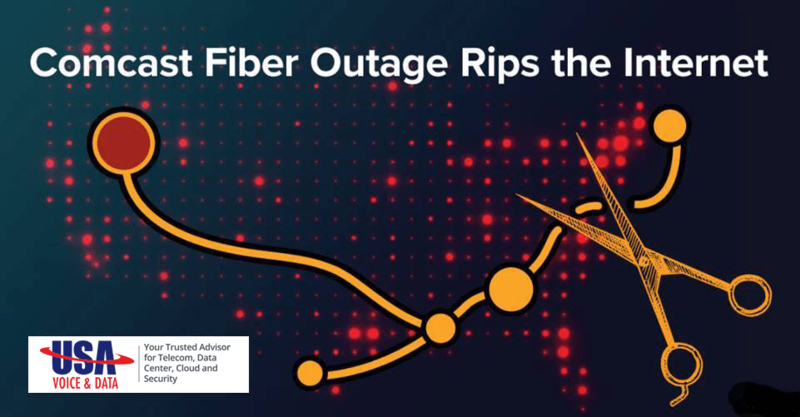 Last Friday, June 29, 2018, Comcast suffered a major nationwide network outage due to a cut in their nationwide fiber backbone. This outage impacted a multitude of both residential and commercial businesses’ broadband internet and voice services. The outage started around 11:30am CST with services eventually being fully restored around 3:30pm CST. CLICK HERE to have your USA Voice and Data Team provide you a free consultation on the many DR or Backup connectivity options available to you. USA Voice and Data not only provides DR or backup connectivity solutions to our business clients we also provide a wide range of SD-WAN services which allow our clients to save money while also getting the best possible performance for all your business applications. Our SD-WAN solutions help you totally avoid the effects of service outages and network congestion by load balancing and intelligently managing your traffic to leverage all your ISP and network connections. CLICK HERE to get a DR, Backup connectivity or SD-WAN solution in place today. We look forward to helping you secure a solid and reliable internet connection for your business. Thanks and we hope everyone had a Happy July 4th – from your team at USA Voice and Data.